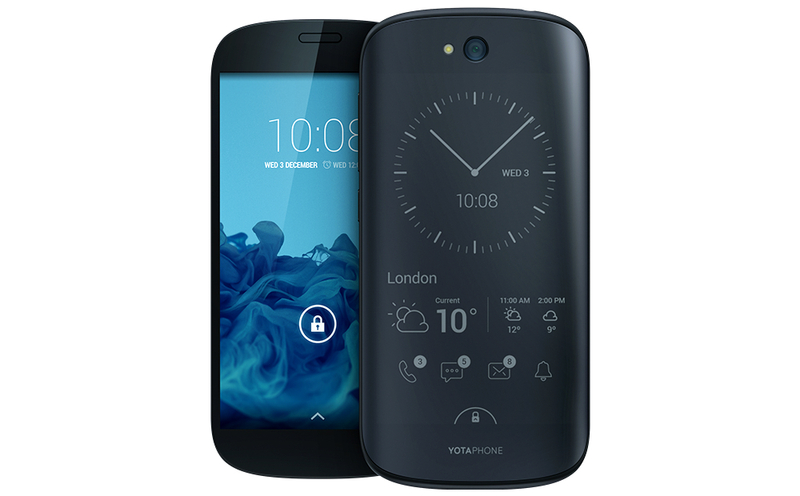 A new smartphone from Yota Devices has been announced this week, the YotaPhone 2. As a successor to the original YotaPhone, the YotaPhone 2 looks to be a great step forward for lovers of hybrid devices, featuring two full displays, one color and one e-paper. It may sound interesting, but allow me to explain a bit. On the frontside of the phone, you will find a full color 5″ AMOLED display. On the backside, and this is where it gets interesting, you will find a 4.7″ always-on E-paper display. This is the same tech you would find on e-readers on the market. You can have the back of your phone display stocks, notifications, or anything else you would like, while the front color display can be used more for media consumption. Other specs include a Snapdragon 800 chipset, 2GB of RAM, 32GB of storage, 8MP rear-facing camera, NFC, Bluetooth 4.0, and a 2,500mAh battery. So, how do you buy one? The phone was only just announced in the UK, and it appears pre-orders will soon start over there. As we see it, the YotaPhone 2 will not be available at retailers here in the US, but we don’t see why you couldn’t import it. However, if you do that, don’t expect it to work well on our carriers. If you end up able to import this device to the US, and get it working, are you interested in a e-paper hybrid smartphone?